Some weeks I’m convinced that I’ll never come up with another idea for a column again. I sink into deep despair and decide that instead of a food writer, I’ll become a goldfish pet sitter or maybe a telemarketer. But this week, I knew crazy early what my subject would be—carrots. Then I told Petey. Yeah, big mistake. Thanks, Captain Buzzkill. Yes, I did do carrots back in February, but that was steamed and glazed grown-ups. This is roasted baby carrots. Big difference. Although he’s an awesome guy, he never has to worry about what’s for dinner. Petey cheerfully eats whatever I put in front of him. He’s never skulked around the kitchen wondering if it would make him a bad person to actually serve cotton candy and gin for supper, because he’s entirely out of ideas. Some nights I’d happily trade my pancreas and my secret stash of Kit Kats for some inspiration. And because I’m aware that I’m not the sole occupant on that iceberg of indecision, this week I’m offering a different version of carrots. No, I don’t know what’s for supper. I really like my glazed carrots, but after picking up some beautiful rainbow babies at the farmers market I wanted something new. My desire was to do minimal fussing, and try to really bring out their carrot-ness. They were roasted simply, then rolled in a light, herby sauce. Here’s the deal about bagged baby carrots. You may remember my warnings against those chemical-laden faux-baby abominations. Really, just leave them in the grocery store. Except for this one exception: organic, rainbow, pre-packaged babies. I picked up a bag at the co-op in Durham; they were the real thing, and cooked up well. 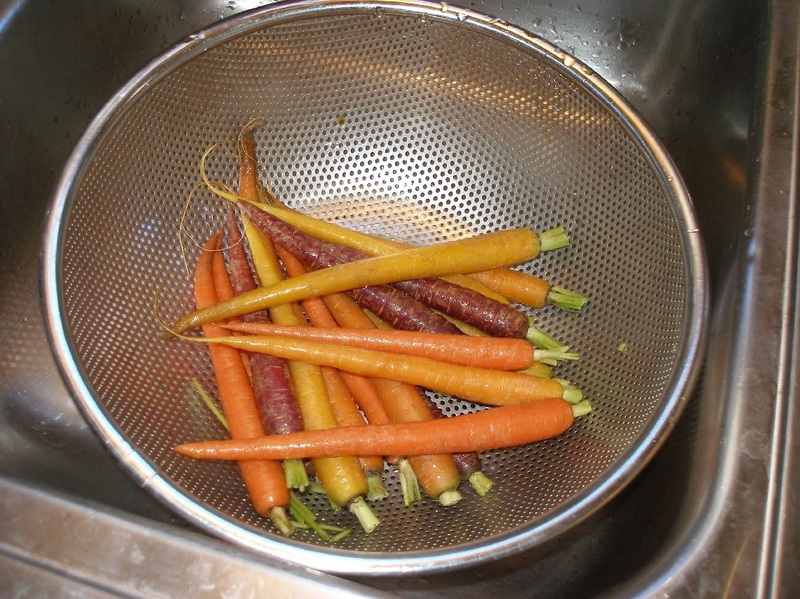 But the best baby carrots don’t come cleaned, peeled, and size-matched. They’re in a bunch with the tops still attached. Take them home and trim the tops to half an inch. Snip off the hairy ends. Using a vegetable peeler not a paring knife, carefully, gently scrape off the skins. You don’t want to shave them into nothingness, but the eating experience is better with the outer layer removed. 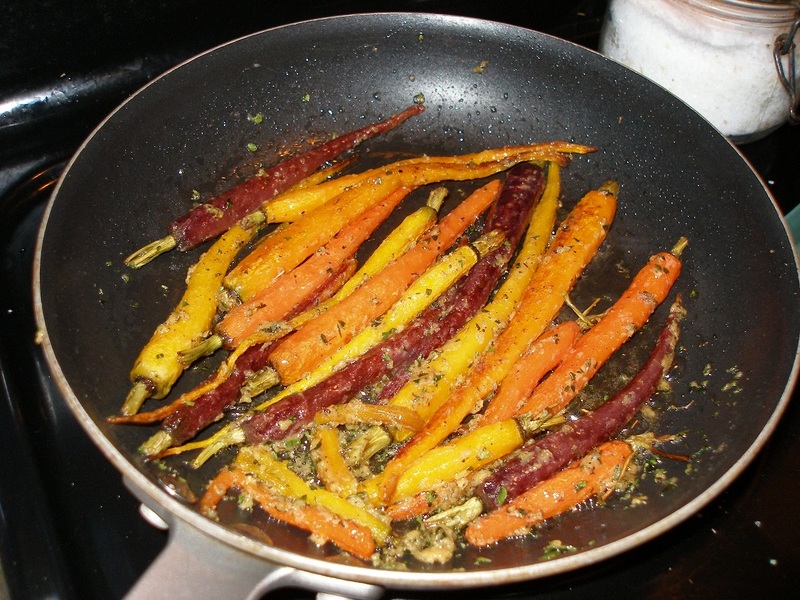 Place carrots in 9X13 glass dish along with oil, salt, pepper, and nutmeg. Mix to coat. Roast for 30-40 minutes or until tender. Remove from oven. Melt butter in a skillet and whisk in mustard and herbs. 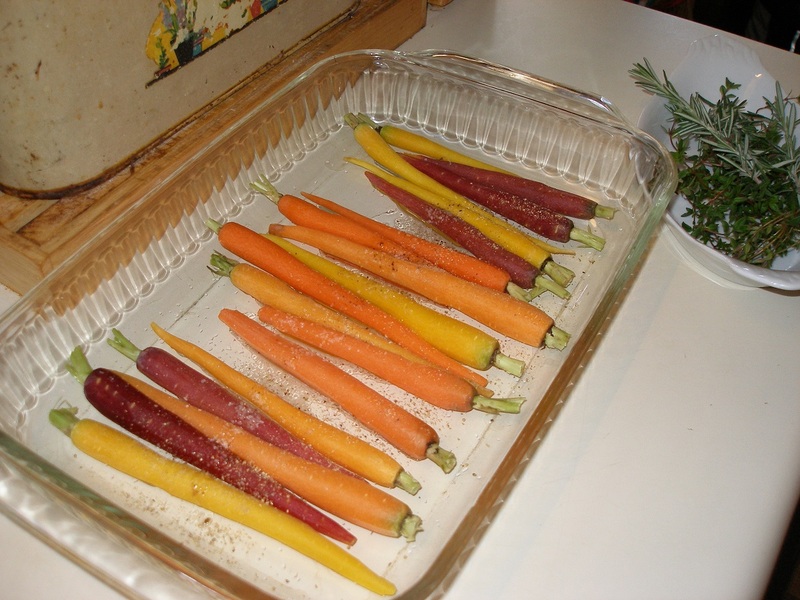 Take off heat, then add carrots, and roll in the sauce until coated. Taste for seasoning. Please don’t get me wrong. My Petey is the most supportive of husbands. During thirty-two years of marriage, he’s been very encouraging of every whim, no matter whether it was my short-lived bartending career, the decision to shave one side of my head and dye the other side fire engine red or any myriad of loony notions I’ve had through the years. I did it decades before Ri-Ri. Petey might not have been very enthusiastic about the topic for this week’s column. But when I set that plate in front of him he ate up those carrots with plenty of gusto.